Disabled people make up an estimated 10 percent of the Pacific population. They are the region’s poorest and most at-risk people but a mix of political, cultural and geographical factors means their needs have long gone unmet. This has begun to change as Pacific leaders commit to agreements like the Pacific Regional Strategy on Disability (PRSD) and the United Nations’ Biwako Millennium Framework, which aim to build a barrier-free, inclusive Pacific. While such regional agreements indicate growing attention is being paid to the issue, action at government level of the disparate island nations varies greatly. Alastair Wilkinson, regional adviser for social development at UNESCAP, says that due to fundamental national differences progress is being made at very different rates across the Pacific. “Melanesian countries are the worst off with the fewest services, early identification, intervention and rehabilitation, and Polynesian countries are not much better off,” Wilkinson says. The regional adviser cautions against making sweeping judgments on the region, however, as the situation can be quite variable from one country to the next. “In the North Pacific, because they receive a lot of support from US mainland programmes, they tend to have quite good services, especially for special education and inclusive education,” he says. Other Pacific nations are essentially able to “export” such challenging social issues to larger countries of which they are “independent but in free association”, such as the Cook Islands and Niue with New Zealand. The Solomon Islands and Vanuatu are also seriously under-resourced in terms of disability support, says Wilkinson. Despite varying conditions across nations Wilkinson says that all Pacific people with disabilities suffer from a lack of services and a lack of community awareness. Aid organisations like the Fred Hollows Foundation New Zealand, which works to eradicate curable blindness in the region, have experienced firsthand the disparities in disability development across the Pacific. Adrienne Kohler, communications manager for the organisation, says its work has ranged from Suva, where they have almost run out of cataract patients, to Papua New Guinea, which is “becoming a forgotten country”. “I’ve just been up there and I wasn’t aware of how bad it was,” Kohler says. She says plenty of aid money is flowing into the country but little is making its way to those who need it and the health situation is overwhelming. “You make progress with one type of disability but that doesn’t mean the situation is improving in other areas. All over the Pacific people with disabilities face discrimination in the form of unemployment, education, accessible environments and communication. For women and children these affects are felt most keenly, as in many cases they are already subject to marginalised status. The children’s aid organisation UNICEF Pacific have in recent years focused their efforts on tackling issues surrounding children with disabilities, who make up about a third of the region’s estimated 832,900 Pacific Islanders with disabilities. In their report Pacific Children with Disabilities published in August this year, the organisation found that while children were well cared for by their families and communities they still suffer significant stigma and discrimination. There is also a prevailing view in many Pacific communities that see disability as a curse or punishment for wrongdoing, which leads to many children being hidden away from society with their needs going untended as an “invisible population”. Women and girls are subjected to a compounded stigma based on assumptions about their status and ability as both females and people with disabilities. A report from the United Nations Development Programme Pacific Centre explains that compared with males and non-disabled female peers, women with disabilities are less educated, experience higher rates of unemployment, more likely to be abused, are poorer, more isolated, and suffer worse health problems. The 2009-published report Pacific Sisters with Disabilities says that although most Pacific nations have ratified at least one or two human rights conventions relating to people with disabilities few have moved with solid legislation in the area. Whether it is because of corruption stemming the flow of aid money or planning not prioritising disability related projects, Pacific communities of the disabled are increasingly looking elsewhere than their governments for help advancing their situations. Disabled person organisations (DPOs) are non-government organisations that seek to assist the disabled communities effectively, making their voices heard by those in power. 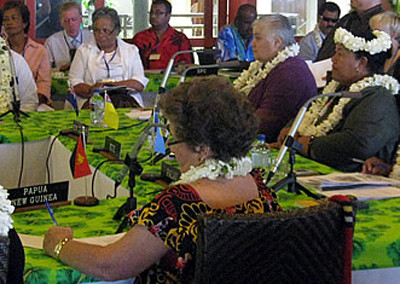 Over the past few decades DPOs have become increasingly effective in the Pacific, successfully lobbying each country to progress their disabled population by making ministerial level commitments to plans like the BMF and PRSD. Australian Pacific Islands Disability Support (APIDS) is one such organisation that works to coordinate support for disabled people across the region, including lobbying the Australian government, facilitating voluntary work by professionals and raising funds for other DPOs in the Pacific. Robyn James, secretary of APIDS, says it is the spirit of cooperation and communication among DPOs in the Pacific that has led to disability issues becoming more visible and higher on the agendas of those in power. In order to keep assisting people with disabilities advance their cause James says that major donors need to start viewing advocacy as a higher priority. “We are a very small organisation run by seven volunteers with skills and interests in advocacy and support rather than fundraising,” she says. With only so much money to go around DPOs often end up competing for funding when their organisational priorities do not align, James says. “Organisations like Christian Blind Mission or World Vision might see disability as a funding priority but they see service provision as a higher priority than advocacy. Despite the often-problematic complexities of the issue, the rights of people with disabilities in the pacific are slowly on the advance. Following this year’s Pacific Islands Forum, the Pacific disability ministers have begun work on applying the PRSD, a regional strategy to protect the rights of people with disabilities and work towards development of a disability inclusive Pacific. Frederick Miller, disability coordination officer at the PIF Secretariat, says that disability is an issue that lends itself to a regional approach that reflects the reality of the Pacific and its unique social, economic and geographic context. The PRSD makes the necessary shift from old charity and medical models to a human rights-based approach to disability concerns, Miller says. With empowerment of Pacific people with disabilities slowly rising, increased cooperation between DPOs and a renewed focus at a regional level, come 2012 the planned review of the PRSD well hopefully tell the tale of a more equal Pacific.